Though the 2018 Spring Game wasn’t able to take place for the fans at the Big House, that didn’t stop the Wolverines from making some big news during the recruiting weekend as 2019 Chaminade-Madonna Prep (FL) CB Te’Cory Couch has committed to Michigan during his official visit to Ann Arbor, flipping from his Tennessee commitment. Couch is an athletic defensive back that could play either cornerback or safety thanks to his length and willingness to tackle, but looks to be set for corner at Michigan. He flashes his ability to read the offense throughout his tape, blowing up screens and counters with his electric closing speed. Though he may need a little time to put on the necessary size to play in Michigan’s defense, he’s a guy I could see pushing for playing time by his sophomore season. Michigan’s defensive back board has seem a lot of changes over the last couple of months with the changes to the coaching staff. Couch was one name that was added to the board at the turn of the new year, and was one most should have been looking at a little closer. After receiving his offer from the staff in mid-January, he told TMI’s Brice Marich that Michigan has always been his dad’s favorite team ($), something that shouldn’t be overlooked. Only thing was, Couch had been committed to Tennessee since June 2017. But that wasn’t the strongest commitment in the world after the firing of Butch Jones and hiring of Jeremy Pruitt. He openly named Miami and Michigan his top two in early April with a decision in mind ($), adding that Don Brown tells him he’s the top corner on the board for UM. That was just prior to his official visit to Michigan the following week. Heading into the visit, TMI’s Sam Webb dropped a commitment watch alert and Crystal Ball for Couch, which had the Michigan recruiting community on watch. And it didn’t disappoint as news of his flip and commitment to Michigan broke from TMI’s Steve Lorenz on Sunday afternoon and was subtly confirmed by Couch himself by adding “University of michigan commit” in his Twitter profile. 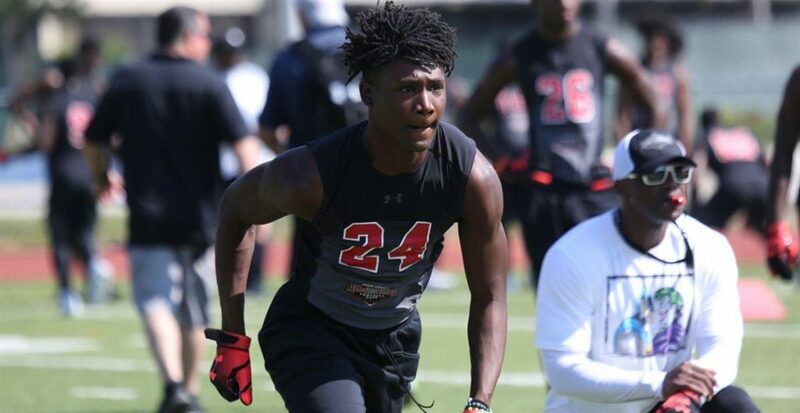 Couch is the 8th overall commitment for Michigan’s 2019 class, the first cornerback commit, and the first commitment out of Florida. Michigan could use a couple more defensive backs in this class but the main focus may be at safety with S Daxton Hill, S Kyle Hamilton and S Lewis Cine looking like top targets. Cornerback targets to watch include CB Aman Greenwood, CB Derek Stingley and CB Chester Kimbrough. As for who could possibly be the next name to drop, it may not be too long before the offensive line gets a boost from both or either of OT William Harrod and OL Karsen Barnhart.